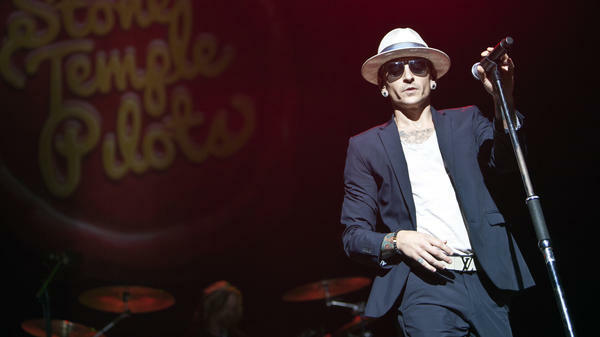 Chester Bennington, a lead singer for Linkin Park and former member of Stone Temple Pilots, performing in Charlotte, N.C., on Sept. 12, 2015. Linkin Park member Mike Shinoda posted that he is "shocked and heartbroken" and that an official statement from the band is forthcoming. Earlier this month, Linkin Park finished a European and U.K. leg of an international tour in support of its current album, One More Light, with guest artists Machine Gun Kelly, One OK Rock and Snoop Dogg; the band's next scheduled tour date is July 27 in Mansfield, Mass. In addition to his Linkin Park work, Bennington served as the lead singer of Stone Temple Pilots between 2013 and 2015. Today is also the birth date of one of Bennington's close friends, the late Soundgarden and Audioslave frontman Chris Cornell, who killed himself in May. Cornell and Bennington were close friends, and the Linkin Park singer sang at Cornell's memorial service in May.